The annual Lower Greenville St. Pat’s celebration is coming our way on March 17th. For many, this is a fun time to mingle around the neighborhood and get to know your neighbors. For others, its an all-day nightmare forcing them to leave the neighborhood for the day. 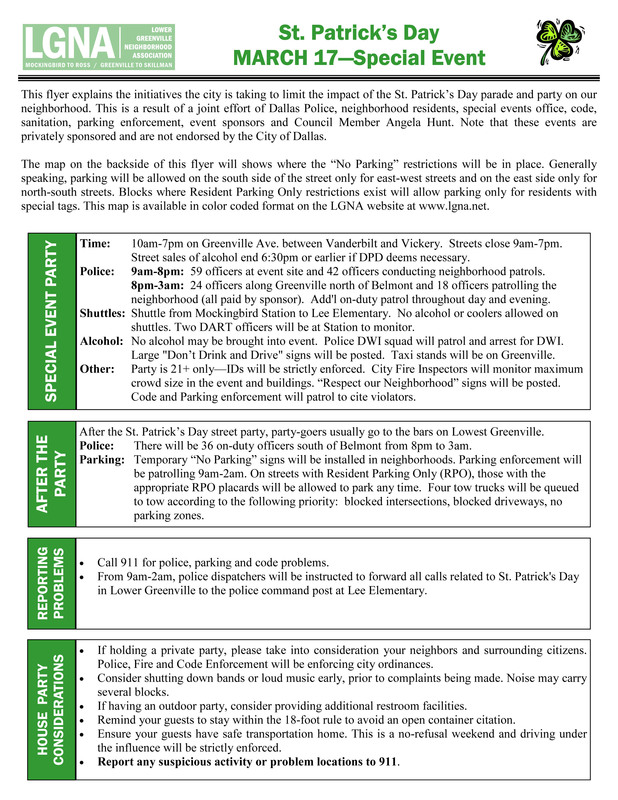 In an effort to quell the impact of tens of thousands of St. Patrick’s party-goers descending upon Lower Greenville residential neighborhoods, LGNA will once again help with the construction and placement of No Parking signs throughout the neighborhood. 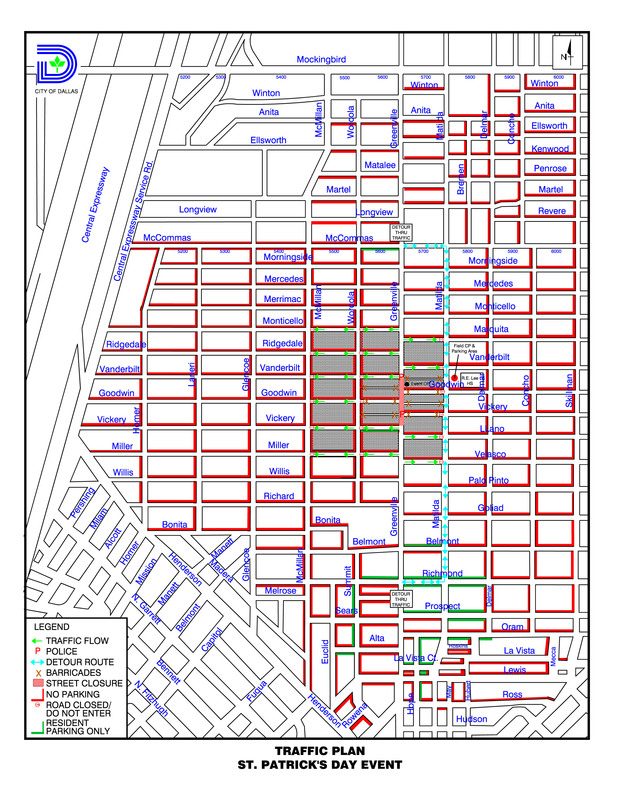 In BACD, parking will be limited to the south side of the street for most of our streets. Concho and Delmar will also have one side only parking, but the side varies based on pre-existing permanent No-Parking signs. No-parking signs will be placed on parkways Thursday evening (24 hours prior to the event), but parking restriction does not go into effect until Saturday morning. A note to residents: Remove your car from the side of the street with signs before Saturday morning, March 17, and tell your neighbors to do the same. Cars parked in violation of the no-parking plan will be towed. There will be no exception for residents. Working with the city, LGNA delivered an information sheet and a detailed map of the parking restrictions to all residents in the LGNA area. Click on either of the images below for more information. We hope you’ll be able to enjoy the day, or at least endure it. This long standing tradition can be a headache for some, but its also a great opportunity to meet your neighbors.